Electrofish/eDNA downstream of Grand Ditch, Baker Gulch; Electrofish/eDNA - Upper Baker Gulch fish distribution/extent; eDNA Collection from specific lakes / water bodies in Never Summer Range. Volunteers can sign up for one-day slots or multiple day slots. Due to the distance to the project site, one-day volunteers need to be willing to meet at the commute site at 6:30 am and should not expect to return to the commute site until 7pm. Once at the destination, there is additional hiking involved to get to the actual work site. Please wear appropriate shoes and clothes for wilderness hiking. Single Day Volunteers - You will need to self-provide for food and water for the day, comfortable work clothes, sunscreen and rain gear. This project is at approximately 9500 ft. in elevation and the weather can be unpredictable. Waders could be needed at any time but, will be needed on days with active fish tagging scheduled. Car pool available�location TBD. Multi-Day Volunteers - You will need to self-provide for food for the number of days you will be attending. Daily water rations will be available at the base camp. Please bring comfortable work clothes, sunscreen and rain gear. This project is at approximately 9500 ft. in elevation and the weather can be unpredictable. Waders could be needed at any time but, will be needed on days with active fish tagging scheduled. Overnight camping will be available at the base camp. You will need to self-provision for this camping (tents, sleeping bags, ground pad, etc.). Do not be fooled by the calendar! The nights are quite chilly at this altitude so please provision accordingly. Car pool available�location TBD. For additional information, see our volunteer site or contact Phil Wright. Grab the poster for the Rist Canyon Mountain FestivalWe have been invited to host a table at the Rist Canyon Volunteer Firefighters fundraiser from 10-4. We have done this for several years and talk to lots of people. There will be music and food! We could probably use a dozen people in two-hour shifts for our usual demonstration activities. Contact Past President Coy Wylie for more information. Funds raised from the Mountain Festival are vital for the financial operations of the all-volunteer, 100% donation-based fire department. September 12: RMF Board Meeting at 7:00 PM. Members are welcome to attend any board meeting. Check with a Board Member for the meeting location and/or agenda. 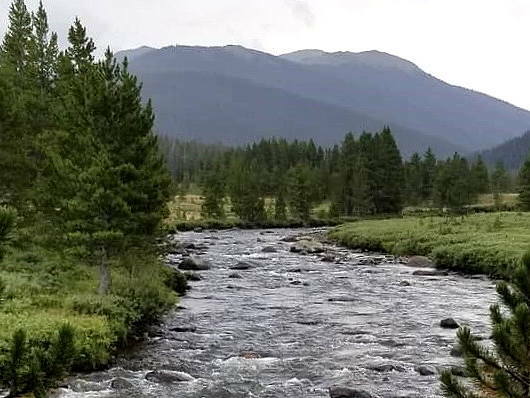 The Coalition for the Poudre River Watershed has invited RMF to participate in a celebration of the 50th anniversary of the Wild and Scenic Act at the Mishawaka. There will be some mini projects in the morning and then a celebration in the afternoon from 1-3pm. The activities include meet and greet, fly tying, and casting demonstrations. Following this there will be music food and drinks. The ongoing changes to our global climate, in the context of the oceans, will be discussed. The oceans are pretty far from Colorado, but Frank Bub will show the relevance to our area. Frank Bub, with a PHD in Oceanography, continues to work after retirement with COMET, creating environmental science education and training programs. We will talk a little about how the ocean works and why deep water fishing can be so expensive. Frank BubFrank Bub grew up in the Pittsburgh area. After college, he joined the Navy as a ships engineer and oceanographer during the Vietnam era. He retired as a Commander after 20 years. Using the GI Bill, Frank earned a PHD in oceanography from the University of New Hampshire. For 13 years, he taught and performed research on ocean observations and modeling there and at the University of Massachusetts. After 9/11, he took a position as ocean modeling technical lead at the Naval Oceanographic Office in Mississippi. His work included the introduction of two new global models and liaison with NOAA, the WMO, and Australia. He went to Japan to help predict radiation flow after the Fukushima earthquake and worked on oil movement across the Gulf of Mexico after Deepwater Horizon. 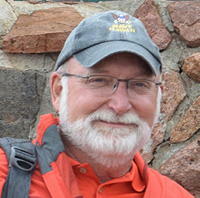 Frank retired in 2014 and he and his wife Susan moved away from the ocean to Windsor, Colorado. He works part time with the COMET program in Boulder, preparing on-line courses in regional oceanography and meteorology. Social hour and fly tying demonstration begins at 6:30 pm at the Fort Collins Senior Center, and the program follows at 7:00 pm. We will have a local fly tyer at each general meeting and an equipment raffle following the meeting. Admission is free and the public is welcome. The Fort Collins Senior Center is located at 1200 Raintree Drive off Shields Avenue between Prospect and Drake. Additional meeting information. Join the group on this September trip to the Green River in Wyoming. Float or wade for some great fishing. Ben Zomer is hosting this trip and there will be room for seven additional people staying in Pinedale. Contact Ben early to reserve a spot on this trip. Over the course of five days, we expect to collect an tag 500-1000 brook trout. The fish will be released at staged locations upstream and downstream of the waterfall. Volunteers can sign up for one-day slots or multiple day slots. Due to the distance to the project site, one-day volunteers need to be willing to meet at the commute site at 6:30 am and should not expect to return to the commute site until 7 pm. Once at the destination, there is additional hiking involved to get to the actual work site. Please wear appropriate shoes and clothes for wilderness hiking. Single Day Volunteers: You will need to self-provide for food and water for the day, comfortable work clothes, sunscreen and rain gear. This project is at approximately 9500? in elevation and the weather can be unpredictable. Waders could be needed at any time but, will be needed on days with active fish tagging scheduled. Car pool available - location TBD. Multi-Day Volunteers: You will need to self-provide for food for the number of days you will be attending. Daily water rations will be available at the base camp. Please bring comfortable work clothes, sunscreen and rain gear. This project is at approximately 9500? in elevation and the weather can be unpredictable. Waders could be needed at any time but, will be needed on days with active fish tagging scheduled. Overnight camping will be available at the base camp. You will need to self-provision for this camping (tents, sleeping bags, ground pad, etc.) Do not be fooled by the calendar! The nights are quite chilly at this altitude so please provision accordingly. Car pool available - location TBD. Follow links on our Volunteer Page to sign up for this opportunity. For additional information, please contact Phil Wright.